ASUS Eee PC Series 900, 900A, 900HA, 900HD, 900SD, 901, 904HA, 1000, 1000H, 1000HA, 1002HA, 1000XP, S101,etc. My stock adapter for my eeePC failed after a few years of use, so I bought this as a replacement. On the fourth use, after inserting the end into my computer, it began alternating between AC power and Battery power very rapidly. I unplugged the unit and inserted into another wall socket, same thing. I ended up taking the section of the power cord that plugs into the wall and swapping it with my stock power cord. It works so far, but most people may not have this luxury. So now i have a working cord, composed of the adapter/netbook plugin of this product, combined with the two prong/wall socket part from my old power cord. I bought this unit for Asus 1000HE, via Amazon. Do NOT buy it. It simply does NOT work consistently, the battery does not charge 90 % of the time. 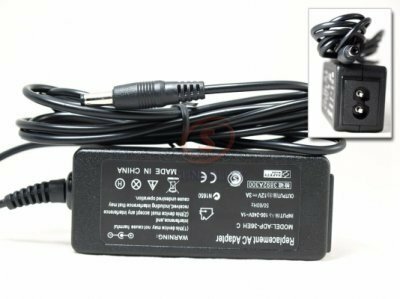 If you run the netbook plugged in to this charger, most times you are actually running off the battery. The charger heats up to a dangerous temperature intermittently. BTW I have a factory OEM charger and it charges the same two batteries perfectly. I figure that the seller bought a batch of factory rejects; some work some don't.